The purpose of intergenerational learning is sharing approaches between older and younger people, enriching the educational needs of each group. Generations”. The aim of this year is to raise awareness of the contribution of older people in society. The purpose is the encouragement of policy makers and stakeholders at all levels to take action to create better opportunities for active aging and to strengthen solidarity between generations. In Greece, although isn’t fully understood the concept of “intergenerational learning” has been implemented many innovative actions and initiatives through European Programs that aiming to share knowledge, skills, experiences and attitudes among elderly and young people. In Greece, the public body which plans and takes action in the field of adult education is the General Secretariat of Lifelong Learning of the Ministry of Education. · Basic adult education, that is to say the fight against illiteracy and the completion of compulsory education. · General adult education and training, that is to say the provision of continuing training, education and training of specific groups at risk of social exclusion, the programs of learning Greek as a second language and education in ICT. · Socio-cultural education and training related to issues like culture, health and environment, as well as information on social, cultural and European themes. · Open and distance education and training and the connection and cooperation with the modern open and distance education systems. Some other Greek organizations that have an indirect or straightly role in implementing initiatives for intergenerational action are: Ministry for Education, Lifelong Learning and Religions, Ministry of Labour, Social Security and Welfare, Institution for Youth and Lifelong Learning, Institute for Youth, General Secretariat for Youth, National Hellenic Research Foundation and many educational centers and senior educational institutions. These entities implement various measures in order to promote intergenerational learning and communication, tolerance between generations and socialization of people who feel socially excluded. 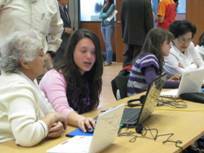 The activity was attended by 14 students aged 11 years old 5 students’ grandmothers. They used video games. The purpose of the event was to exchange experiences in games from different periods. The purpose is the modern and complex forms of knowledge. Production and viewing television programs and the extensive breeding and disposal of the educational community in DVD format. The issue for “Digital Media Training for Active Ageing and Solidarity between Generations” is presented between others broadcasting issues. The purpose of the initiative is to bring beautiful and nostalgic patterns of the past. In the initiative participated young and old people who had the opportunity to discuss about the entertainment of the past and the new ways of life and exchange ideas. Member of AGE PLATFORM Europe http://www.age-platform.eu which represents European citizens over 50 years of age. Improve the quality of life of those over 50 years of age in Greece, within a more equal society and through actions and activities affecting all aspects of life. Participation in European competition for the selection of the best initiatives of each country in relation to intergenerational solidarity.